Get The T-Shirt! 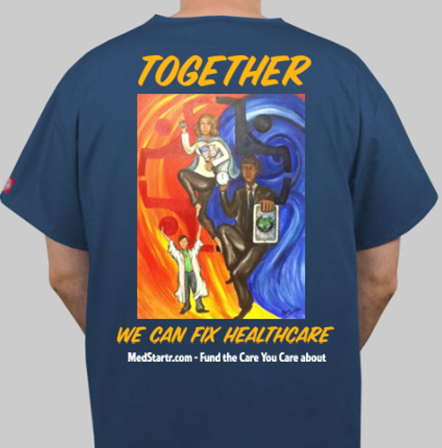 Get your very own "Healthcare Revolutionary" Tee with Regina's Crowds Care print on the back and wear it with pride. Please include $8 for shipping outside the US. NEW - The Walking Gallery T-Shirt - get a Walking Gallery T with the Welcome to the Walking Gallery image depicted to the left here. You asked for it, you got it! Thank You for your support! FOR $100.00 OR MORE, a copy of 73 Cents, a documentary by Eidolon Films. The film celebrates the mural entitled "73 Cents", a painting that has helped to shape health policy. Get Credit - Your name will appear in the credits under the heading "Thank You for your support on MedStartr" in the credits of the film. SWEETHEART DEAL! A Copy of the DVD with signature Regina Holiday cover art and a few songs by #MedicineAsMusic artists from the film AND the T-Shirt AND a mention in the credits! What a deal! STILL A SWEETHEART DEAL! A Copy of the DVD with signature Regina Holiday cover art and a few songs by #MedicineAsMusic artists from the film AND the T-Shirt AND a mention in the credits! Leader Credits - Your Name and Company will appear in the credits under the heading "Healthcare Leaders that Supported the Creation of this Film"
Provider Credits - Your Name and Practice will appear in the credits under the heading "Doctors, Nurses, and Allied Clinicians that Supported the Creation of this Film"
Big Logo Company Credits - Your Company Name and 1/3 screen logo will appear in the credits under the heading "Companies that Supported the Creation of this Film" and a smaller version in title sequence. Includes 3 copies of the DVD and 3 T-Shirts. Company Credits - Your Company Name will appear in the credits under the heading "Companies that Supported the Creation of this Film"
Bring the 73 Cents Film Night to your School of the Health Professions (Nursing, Med, Grad, Osteopathy,...) We think every school in the country should show the Walking Gallery Movie to every student to inspire them to become the Participatory Physicians, Nurses, Professionals, and Leaders of the Future. To do this we have a special Walking Gallery Movie Night package with includes handouts, a list of local Walking Gallery Members to invite, inclusion in a special listing of Schools with Logos in the credits, and Includes 3 copies of the DVD + 5 T-Shirts. Great idea for a Student Event, charge $10 a ticket and raffle off the T-Shirts and DVDs while meeting some of the leaders of the Participatory Medicine movement and starting a S4PM chapter at your school! Full Screen Logo Company Credits - Your Company Name and full screen logo will appear in the credits under the heading "Companies that Supported the Creation of this Film" and a smaller version in title sequence. Includes 5 copies of the DVD and 5 T-Shirts. Sponsor a Walking Gallery Screening in your town and invite as many people as you like to your conference room, auditorium, or other venue of choice. Includes Framed Movie Poster, 5 copies of the DVD and 5 T-Shirts. School of the Health Professions (Nursing, Med, Grad, Osteopathy,...) Screening Package – We think every school in the country should show this to every student to inspire them to become the Participatory Physicians, Nurses, Professionals, and Leaders of the Future. Includes Instruction Materials for teaching and special listing of Schools with Logos in the credits. Bring Regina and Sponsor a Walking Gallery Screening in your town and invite as many people as you like to your conference room, auditorium, or other venue of choice. Includes Framed Movie Poster, 5 copies of the DVD, 5 T-Shirts and Regina Holliday at your screening and firing up your company, community, or conference! Regina Guest Lecture at your School of the Health Professions (Nursing, Med, Grad, Osteopathy,...) Screening Package – Bring your School into the age of Participatory Medicine with Regina Holliday as your personal guide. Includes Instruction Materials for teaching, special listing of Schools with Logos in the credits AND Regina teaching up to a 3 Hour class on Participatory Medicine. Get to the forefront of the Partnership with Patients Movement and put your school on the Map! We need to spread The Walking Gallery movement. To do that we need a short film to use as a how-to guide so other artists and Walkers can join The Walking Gallery. What is the Walking Gallery? This second crowdfunding goal is to raise money so the team at Eidolon Films can make a short documentary about The Walking Gallery. Eidolon Films created 73 Cents, a wonderful documentary about the mural 73 Cents, a painting that helped shape health policy. Our goal in creating this new documentary is to spread this patient advocacy movement to an even wider audience, recruit more artists and to inspire more people to walk with stories on their backs. My First Project vs. This One! 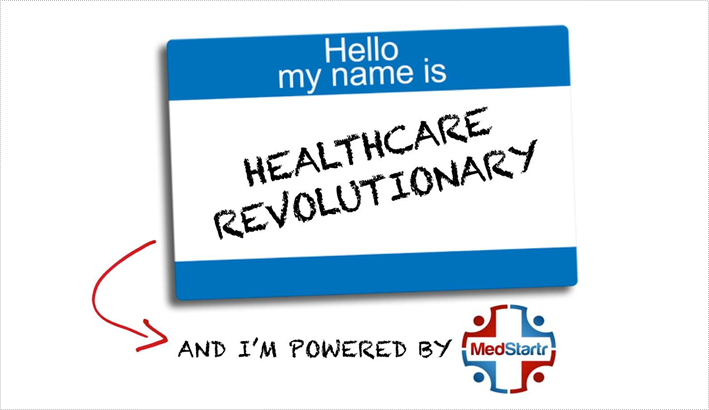 Medstartr fans might notice this is my second crowdfund on this platform. The first one paid for the travel, lodging and set-up costs for a Kansas City gathering of the Walking Gallery at the Partnership with Patients Summit in September of 2012. That event was a big success and was written about by Sarah Barr, a staff writer with Kaiser Health News. Regina Holliday is an activist, artist, speaker and author in Washington DC. You might see her at a health conference painting the content she hears from the patient view. She is part the movement known as participatory medicine. She and others in this movement believe that the patient is a partner with their provider and both should work together as a team. Regina, like her friend Dave deBronkart, is also an e-patient. She utilizes the tools of technology and social media to better understand the patient condition and the landscape of medicine. Regina is a mother and a widow; she speaks about the benefits of HIT and timely data access for patients due to her family loss. In 2009, she painted a series of murals depicting the need for clarity and transparency in medical records. This advocacy mission was inspired by her late husband Frederick Allen Holliday II and his struggle to get appropriate care during 11 weeks of continuous hospitalization at 5 facilities. Her paintings became part of the national debate on health care reform and helped guide public policy. The Art of Regina Holliday is featured on the back of the MedStartr T-Shirt. This is the T-Shirt we are using for this campaign too. The Front was designed by the fabulous Dr. Nima Sheikholeslami of PositiveMed, also awesome! Coming to teach a class for a day at your school to the providers of tomorrow, patient activists, or even employees for employers that want to have a healthier workforce and drive down costs, is a perfect way to spread the message. Don’t see one you like? Suggest one here.